Advice from the internet about plants for pollinators can be confusing and contradictory. I discuss below some of the common failings of planting advice. My approach, which I describe on this page, is based on my experience and observation over many years. It's not just the type of plants you grow - a pollinator-friendly garden needs to provide insects with shelter and warmth, and possibilities for nesting. Although herbaceous wild flowers from Britain and Ireland are fine for pollinators, some of them become ‘high-maintenance’ in a garden situation because they tend to require very low-nutrient soil and most garden soil is too fertile for them. However…there are many other species of flowers from across Europe and the Mediterranean area which are closely related to our wild flowers and which are highly garden-worthy as well as attracting a broad range of insect species, and not just the common ones. ‘Biodiversity’ means ‘species richness’ so attracting a diverse range of pollinators to your garden cannot be a bad thing. Traditional cottage garden flowers are perfect. Aromatic herbs such as Angelica, Fennel and Tansy and shrubs such as Lavender and Curry Plant (Helichrysum italicum) are typical examples of the flowers that I recommend. Woodland flowers such as Monkshood (Aconitum) and various kinds of Campanula, Scabiosa and Pulmonaria are also ideal. There are many other examples. The more exotic ornamental flowers that originate from outside Europe (such as Dahlia, Gaillardia and Fuchsia) are sometimes buzzing with insects but they tend to attract just the common and versatile pollinators such as honey bees, Buff-tailed bumblebees, Drone Flies and so on. I do grow a few of these as they give late-season colour, and provide forage for the late-season bumblebees, but they are not the mainstay of the garden. It is now widely recognised that sterile, manicured, over-tidy gardens are not good for wildlife. I don’t advocate a weedy wilderness, but garden maintenance has to relax a bit. Pollinators don’t just need flowers, they need shelter in which to hide from bad weather and they need nest sites. 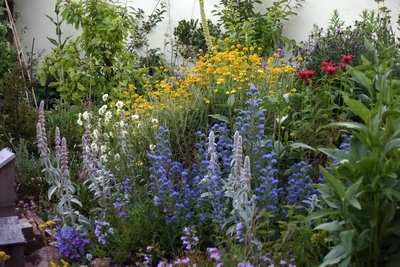 The traditional ‘cottage garden’ approach of informal borders overflowing with flowers is a good template to follow. One is in a very dry and sunny situation with very well drained soil. This is mainly a raised bed. On the other side of the garden in a slightly damper soil is a border of tall perennials, different in character to the other border. This is not a big garden (50ft x 50ft, or 230m2) and like most keen plants-people I pack a lot of plants in a small space. Everything intermingles and they help to support each other. It is possible to predict with a reasonable degree of accuracy what plants will attract what kinds of insects, and, indeed, what plants will attract no pollinating insects at all. I'm afraid that there are rather a lot of plants in the latter category that are sold in garden centres and the nursery trade. Here are some lists of suggested planting to attract pollinators. These lists are not exhaustive, but if you are not sure what to plant, just follow these lists. All are PDFs. Solitary Bees in Your Garden - this fact sheet contains a section near the end which recommends certain flowers that will attract specific species of solitary bees to your garden. 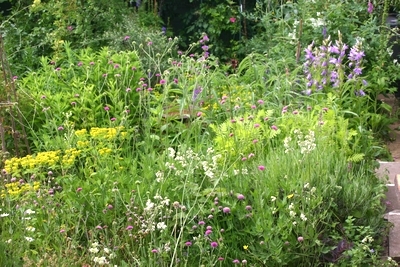 Additionally, 'RSPB Gardening for Wildlife', by Adrian Thomas provides a list of ‘top 400 garden plants for wildlife’. More details about this book on my Recommended Reading page. Finally, Dave Goulson's web page called 'The Best Garden Flowers for Bees' gives a good straightforward planting list with illustrations. Here is an updated list of the core planting in our own garden. There are two versions, the short one is simply a plant list, the long version contains commentary about each plant and I have marked my choice of the very best for attracting insects. The two versions of the list are saved as a pdf. The short list is in 'portrait' format, the long list is 'landscape'. Some advice assumes ‘pollinators = honey bees’ and just lists the best forage plants for honey bees. - In fact there are many hundreds of species of pollinating insects in Britain and Ireland, many with quite different needs to honey bees. Some advice assumes you must grow ‘wild flowers’ or ‘native’ flowers in gardens without defining what the author means by these terms, nor explaining why the author makes the assumption that they are best for pollinators. - It’s more complicated than that, as I hope the rest of this website explains. Go to Garden Meadows for a discussion of the term 'wild flowers' and go to 'Re-defining Native Plants' for a discussion of the term 'native'. Some advice assumes you can just plant anything, because ‘the pollinators turn up anyway’. - True to an extent, but this is likely to favour the very common and versatile species, and may not meet the needs of the more specialised majority. Flower Shapes and How Insects Feed from Flowers explain why you should carefully choose what you plant in order to provide for the diversity of different sorts of insect pollinators. Planting advice for pollinators rarely takes into account the needs of moth and butterfly larvae. - It is the food plants of caterpillars (i.e. leaves of particular plants) that really matter for the successful reproduction of moths and butterflies. Some advice lists ‘nectar plants for bees’. - This overlooks the fact that pollen, not nectar, is the main food of their young. Look for plants that have been grown in peat-free compost. By using peat in horticulture we are destroying important habitats for wild pollinators. If you buy plants in flower in the spring or summer, chances are that they have been treated with a persistent insecticide in the nursery, and their pollen or nectar may be contaminated. You can reduce the risk by buying plants in the autumn or winter. This is the best time to plant perennials and shrubs anyway. Alternatively go to an organic nursery (they do exist, and deserve support), or grow from seed or from cuttings from a friend's garden. When you are in nurseries or garden centres it is worth raising the issues of peat-free growing media and the use of insecticides on plants in flower. Garden centres are like supermarkets; they will not change their ways unless they perceive that there is sufficient customer demand.